“Mr. Richardson...and Ms. Worra each did not miss a beat in vocal roles which required supreme confidence to sing either unaccompanied or against accompaniment that is deliberately of no help harmonically. ...Ms. Worra conveyed sympathy for Grimes in a voice which was light when necessary and especially soared over the orchestra in the opening to the second act, accompanied by a chanting offstage chorus. This couple was well matched, and at times controlled the score themselves without conductor or orchestral accompaniment. "At the center of this piece is Caroline Worra, making her Tulsa Opera debut as Blanche DuBois, and she is extraordinary. Worra is rarely off-stage during the nearly three-hour production, but the energy — and, more importantly, the subtlety — she brings to this character never flags. 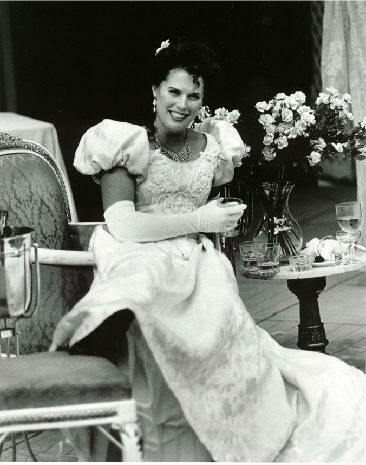 Near the end of the opera, Blanche states that she tells “the truth as it ought to be,” and you can see that working in how Worra portrays the character — the forced brightness in her voice when she is trying to convince those around her of the “magic” she thinks she brings to life; the more brittle tone that informs the impolite truths Blanche spouts about her current situation and the people who populate it; the palpable, wounding hurt as she recounts the course of her brief, tragic marriage. 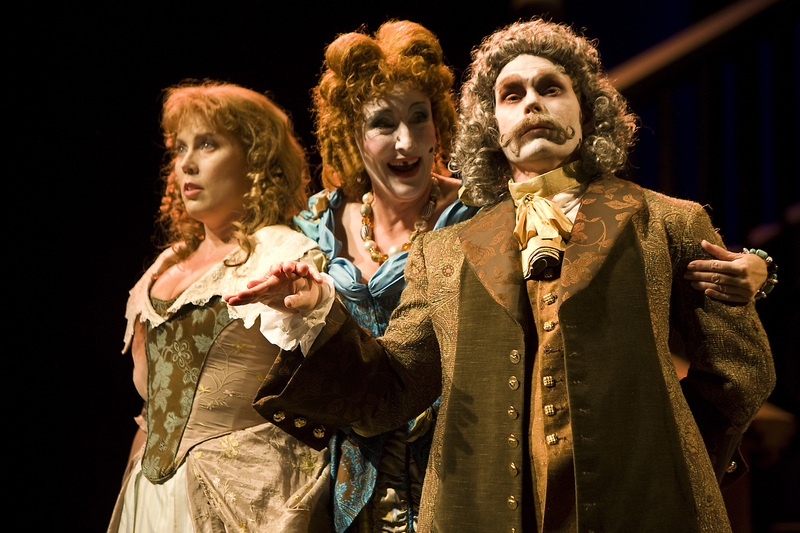 "Cipullo gives us a quartet. He casts Thompson (Younger) as a tenor, played by a heartbreakingly vulnerable David Blalock, and Thompson (Older) as a baritone, played by an astounding Michael Mayes. Lyric soprano Sydney Mancasola plays the younger Alyce, and the more spinto soprano Caroline Worra gives an amazing performance as the older Alyce. "Leading the cast are its two most experienced pros, soprano Caroline Worra and baritone Michael Chioldi, as the Countess and her unreliable Count, both of whom have performances at New York's Metropolitan Opera on their resumes. Hers is a voice of shimmering beauty and unostentatious power. She sang the Countess' signature arias with such elegance and precision, and hammed it up nicely in the opera's final act. "When I first saw THE MINES OF SULPHUR in its North American premiere in Toronto in the 1970s, I was absolutely riveted from beginning to end. Here is a gripping tale of murder and a ghostly theater troupe to which Richard Rodney Bennett's beautifully crafted atonal score is perfectly suited. I remember Toronto critics pointing out some inconsistencies in the plot development, but following the libretto, I can't figure out at this distance in time, what they were. This live performance from Glimmerglass confirms my initial strong impression. There is an excellent liner note and a full libretto..
"Caroline Worra as the Older Alyce also brought both dramatic skills as well vocal power and expression. She delivered the very difficult emotions of shame and defiance in the powerful aria, “After you hear me out,” putting across the position of someone whose faith had flagged, someone who couldn’t live up to the image of the devoted military wife. Soprano Caroline Worra has been hailed as "a new soprano powerhouse" by The New Yorker. In Time Out New York, the composer Mark Adamo had this to say: "Caroline's an immaculate musician and vocally complete, but that's only where a singer starts. Her sound is utterly her own--rich, bright, crackling with intensity--and every time I hear her, she's a bolder, more inventive actress." From January 28-31, you can hear her sing the role of The Governess in Madison Opera's production of The Turn of the Screw. There's a reason our casting of Ms. Worra as The Governess caught the attention of Opera News magazine: she is known for excelling in contemporary repertoire. I first heard her as a stunning Eurydice in Philip Glass's Orphee at Glimmerglass Opera in 2007; with that same company, she earned a Grammy nomination for a recording of The Mines of Sulphur and high-praise for creating the title role in The Greater Good: The Passion of Boule de Suif. Earlier this season, she was Miss Rose in the world premiere of Stephen Schwartz's new work, Seance on a Wet Afternoon. But to focus only on her work in contemporary opera would ignore her huge range. She's recently performed Marguerite in Faust with Opera Memphis, and this month, she is in Chicago at the Lyric Opera for Hanna in The Merry Widow. Perhaps these two videos of Caroline (Verdi's Il Corsaro and Stravinsky's The Rake's Progress) capture it best. "...to the Wintergreen Festival in Southwestern Virginia to hear Caroline Worra sing Knoxville as part of the Festival. I had raved about Worra after hearing her as Helena in Midsummer in New Jersey... the drive south was more than worth it for these 17 minutes hearing Caroline Worra, and I expect to hear her do Elettra in Boston in the Spring, I may try to make it for her Governess in Madison in January (but then, I love Britten and cold weather) and those in the Chicago area should know she's covering Elizabeth Futral as Hanna at Chicago Lyric Opera, and though I like Futral, I'd hightail it to any performance that Worra got to do if I were you. Her singing in English - which I think is really a golden language for her - is always clear and she has a special way in making the words bear emotional content without overemphasizing them. The breath support is really impressive and she is just great to watch and 'communicate with' on stage - again, she reminds me of all of the wonderful parts of Sills without that last dollop of aggression that Sills sometimes forced into her comic roles - and I'd think she'd be a spectacular Hanna if given the chance. TONY's favorite artists give a nod to the rising stars they're watching. What’s the story? Caroline’s an immaculate musician and vocally complete, but that’s only where a singer starts. Her sound is utterly her own—rich, bright, crackling with electricity—and every time I hear her she’s a bolder, more inventive actress. First encounter? I met her as a Glimmerglass Young Artist, preparing her first Amy in the Little Women production she later accompanied to New York. Latest sighting? I engaged her to sing Lysia on the demo recording of Lysistrata. I’ve also heard her in The Mines of Sulfur, The Greater Good and most recently in Lance Horne’s terrific Three Lost Chords at the Zipper Theater. In “The Girl I Left Behind Me,” the central scene of Three Lost Chords, her intensity was such, you could hardly draw breath. Stolen anything? By definition, I can’t really steal anything from Caroline. But, as Leonard Bernstein once said of Maria Callas, if I could sing like that I’d never write another note again. "The three singers in the show each portray a character based on short stories: Franz Kafkas A Hunger Artist (about the predicament of a man who hates food), Muriel Sparks The Girl I Left Behind (about a young woman struggling with a strange kind of memory loss), and Edgar Allan Poes well-known A Tell-Tale Heart. Nathan Lee Graham, with a resume that is a mix of television and movie roles, Broadway, and classical, portrays Kafkas hunger artist, while Michael Slattery (Poes guilt-plagued murderer) and Caroline Worra (the woman trying to remember what she is missing) are both well established in the classical universe. Id somehow managed to miss Worra when she sang Jenny in Bennetts The Mines of Sulphur at New York City Opera in 2005, for which she got excellent reviews, and was glad of an opportunity to hear this singer that has had New Yorker critic Alex Ross calling her a new soprano powerhouse. Worra is intriguing indeedshe has a big voice of exceptional beauty that has sharp edges and is also capable of precise coloratura, and she has a voracious appetite for new music. She sings everything from Handels Semele to Mozarts Donna Elvira to music by composers such as Stephen Hartke, Philip Glass, and Richard Rodney Bennett; one the upcoming performances shes most excited about is the Composers & the Voice Workshop Series, presented next month in New York by American Opera Projects. This fall she takes on a world-premiere opera, Blizzard Voices, at Opera Omaha, and reprises her role as Jenny in Bennetts The Mines of Sulphur at Irelands Wexford Opera. When I spoke to Worra for a few minutes after her Sunday performance in Three Lost Chords, she explained how it is she has come to sing so much new music. Im a fast learner, was her understated response. Uh, it turns out she learned the lead role, Boule de Suif, in Hartkes The Greater Good in exactly one week when she sang that at Glimmerglass Opera in 2006. She says it helps speed up the learning process that she started off as a piano major before switching her main focus to voice; she still has a piano teaching studio of 35 students. Right now, shes excited about her first Metropolitan Opera engagement: understudying the role of Mrs. Naidoo in Philip Glasss opera Satyagraha, a highly anticipated co-production with English National Opera, scheduled to have its Met premiere on April 11. This is not Worras first Glass opera; she sang in his Orphe last summer at Glimmerglass. As she describes it, In Satyagraha, there are a lot of instructions in the score like repeat these two measures eight times or sing this whole section twice. The wonderful acting troupe Improbable is constantly onstage with us, manipulating these giant puppets and crinkling paper and so forth. I play an Indian lady whos an adviser to Gandhi. There are no Met Titles at all! Its in Sanskrit, and there will be just a few projections of text on the stage, so people have a general idea of whats going on. "Worra, leading light of the Greater Good"
"The radiant Caroline Worra takes the leading role." "In addition to some old favorites, Glimmerglass' lineup includes a new opera starring a gifted young soprano"
"Greater Good gets a grand world premiere at Glimmerglass Opera"